On Tuesday, 9/25, we finished our DNA Extraction protocol and ran out the 'DNA' with gel Electrophoresis to see if we actually had any. We ran a 100 bp plus Marker, our genome DNA, and our DNA digested with ECOR1. This is a picture of the gel: []. The first well is the marker, well 2 is whole DNA, and well 3 is digested DNA. This shows us that we have about the appropriate size of DNA and it is good to work with. We also made our stock solutions of our extended primers. On Thursday, 9/27, we planned out and executed our PCR reaction set. 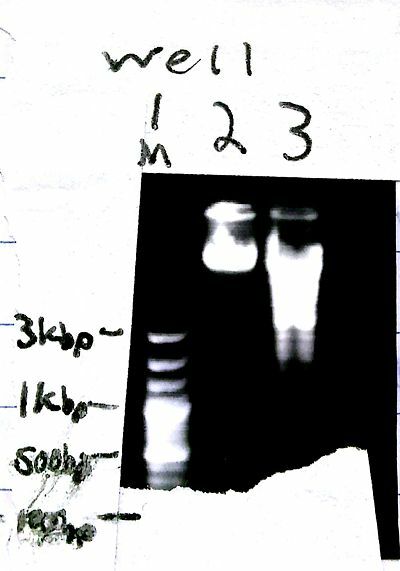 We ran out a negative control, primers without DNA template, and a positive control, plasmid 1A7 with VF2/VR primers which were provided by our instructor Dr. Axel. We ran 3 sets of our DNA samples with different annealing temperatures. 1 set with 65°C, 1 with 60°C, and 1 with 55°C. The reactions were to run overnight and stored at 4°C (in freezer) for the weekend. We will run these out on a gel Tuesday, 10/2, to look at our results. This page was last edited on 26 September 2017, at 22:04.